The fact that I’ve stuck with the #bulletjournal and #calligraphy communities on Instagram for over two years now is a testament to so many of you all – all 75K+ of you. 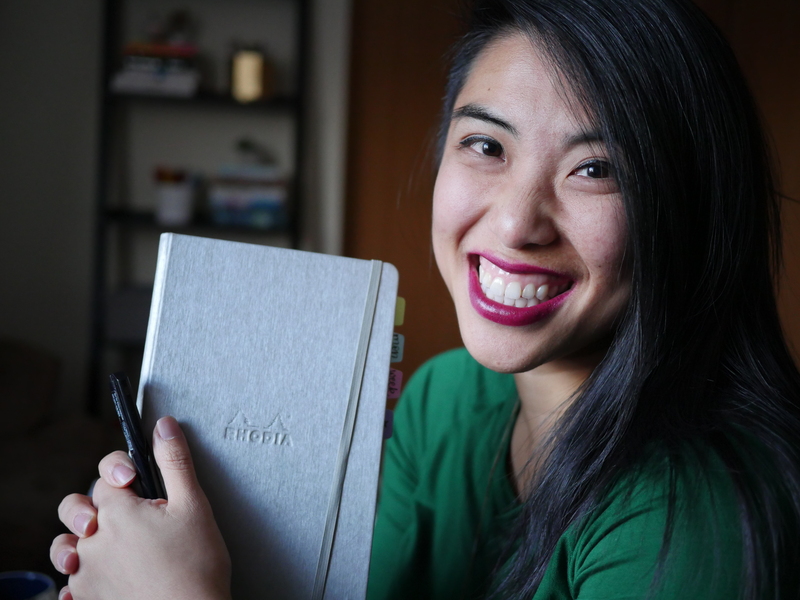 More important than the numbers is the hope that I’ve been able to share my own story and ideas and thoughts about planning or bullet journaling that have been helpful to you. To celebrate, I’d like to do a giveaway in partnership with one of my favorite brands, Rhodia. Thanks to Rhodia, we are giving away FIVE Rhodia Softcover Notebooks! Winners will get to choose their favorite color and try out the majesty of their luscious paper. The Instagram policies effective June 1 2016 made it more difficult for giveaway widgets like these because they won’t allow for Follows on Instagram – so I’m trying my best to make those things clear in how to enter below – thanks for your grace! Click here to enter the Pretty Prints & Paper 75K Rhodia Giveaway! I love these colors. Now I want one of each! I started BUJU over the summer and just have not found my style yet. I want to keep track to certain items and habits but it’s figuring out and making it my own that I have yet to do. Thank you for the chance to win! love love love rhodia products!!!!!!!!!!!!!!!!!!!!!!!!!!!!!!!!!! So excited about even the chance to win this giveaway! The possibility is exciting! Thanks! I’ve been bullet journaling for a year now, and something I still struggle with is the desire for my journal to look beautiful versus having it be functional and practical for my lifestyle. I’m getting there! Just starting to bullet journal so I’m looking to test out different notebooks. Rhodia has been one of the items on the top of my list! As you’ve been planning or bullet journaling, what has been an issue or problem you’ve been having? Mostly its been the Monthly log design. I’ve tied to a calendar, so I suppose I should just use that instead. The biggest issue I have had with bullet journaling is remembering to index my lists and spreads that i need to refer back to. i have enjoyed learning about your use of the rhodia pads. i ordered their graph pad and fell in love with the paper for my lettering sketches. Next i want a dot grid notebook for my bullet journaling. I really love that you talk about how the bullet journal system works with you and your need. I really enjoy reading about how you incorporate your mental health in your bullet journal. I especially enjoy your lettering tutorials, and I wish you’d do more of them! I especially liked the “dupe or dud” series. Love these. My hardest thing is making time and consistency! Wonderful giveaway. Thanks. To answer one of your questions, I am new to bullet journaling and am still waiting for the book I bought through a kickstarter project. Meanwhile I have been gathering information and putting together a list of they types of things I will put in my journal (habit tracker, birthday chart, etc.). So the biggest issue I am having is how to create a journal that will be a useful tool and one that I will easily be able to maintain rather than have something that becomes too onerous to keep up with. Fantastic giveaway! I hope sharing it on my Instagram publicizes it for others to get a chance to win. I’ve always wanted to try one of these for my brush calligraphy practice, but I will probably share it with my sister for her birthday instead if I win. Love reading your posts, please keep them coming! Also, I haven’t done any bullet journaling yet, but I know I will definitely refer to the layout posts here when I finally make that leap! The recommended pens for calligraphy post is so much fun, I often reread it! Congratulations on the blogiversary!! Love Rhodia paper for handwriting and lettering practice and would love to try one for my Bujo! Thanks for the giveaway! The challenge so far for me in planning and journaling has been to remember to actually do it regularly and consistently! Thank you for all you do! I would not be billet journalling without you! OMG I recently found out about these pads and have been wanting to try them ever since! I really want to start up bullet journaling but I haven’t been able to find a journal with the right fit- but I think these might be THE ONES! I really want one of these but how will I ever decide on a color?? Rhodia ❤ ❤ ❤ Want 1 in every single color!! It's so AMAZING of you & Rhodia to come together & do this giveaway. Best of luck to everyone!! !